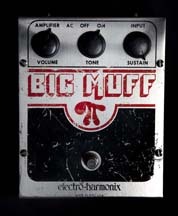 The earliest known documented recording of the Big Muff Pi was by guitarist Tony Peluso, who recorded the solos for The Carpenters hit Goodbye to Love in 1972 with a V1 "Triangle" Big Muff, using a Gibson ES-335 recorded directly into the recording board with no amplifier. A very rocking solo for the time, and very heavy for the Carpenters, the use of the Big Muff in this song paved the way for the rock and roll power ballad. A year after that, the funk/soul scene was hammered with the famous solo from the Isley Brothers hit, (Who's) That Lady, played to perfection by Ernie Isley. 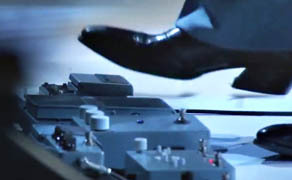 There are various accounts of what was actually used in the studio, some sources state it was recorded directly into the mixing board with a Strat and Roger Mayer Octavia, but other sources state it was a Big Muff and Maestro Phase Shifter, and Ernie also used a Big Muff and a Maestro Phase Shifter when playing it live throughout the 1970's (the modulation on the record actually sounds identical to the Maestro too). The Isley Brothers songs Climbing Up the Ladder and Voyage to Atlantis from 1977 are other examples of Ernie playing lead with the Big Muff. A V2 Big Muff is pictured on the Isley Brothers stage in the photo below, circa 1975, along with the Maestro to the left. 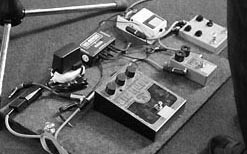 Another 1970's Big Muff user (along with the rebranded version for Guild caled the Foxey Lady) was guitarist Robert Fripp, of King Crimson, who was reportendy using one in 1971. Jimi Hendrix may have also been another user, contrary to what many experts claim. He purchased one the year he died, though it is unknown if there are any recorded examples of him using it. 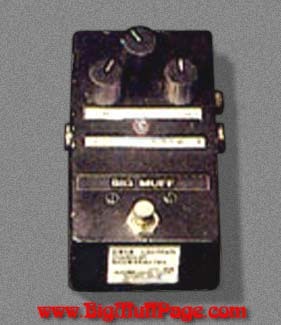 The V1 Big Muff was likely for sale in late 1969 (not 1971 as many sources incorrectly claim), and definitely was on the market by 1970, the year Jimi died. 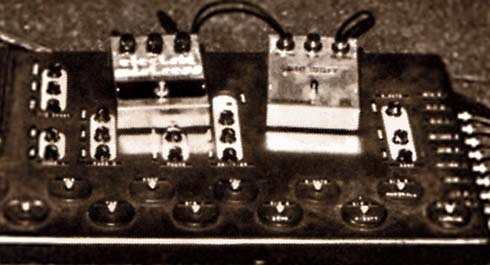 E-H founder Mike Matthews, and others, have stated Jimi bought one at Manny's Music in New York, and Mike claims to have witnessed Jimi using it in the studio in 1970. 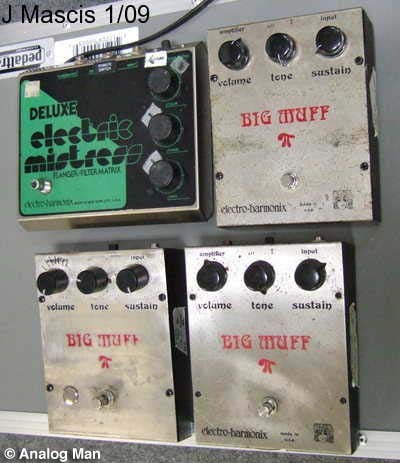 Guitarist Carlos Santana, who purchased a Big Muff in 1971, was also often associated with the Muff in Electro-Harmonix advertising, though it is unknown if he ever recorded with one. It was possibly used on the Santana (aka Santana III) album released late in 1971, though Carlos may have used a borrowed Big Muff on some tracks from Abraxas. 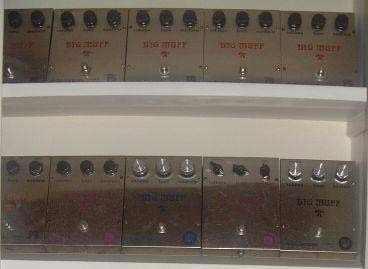 The most well known and most heard Big Muff user would have to be David Gilmour of Pink Floyd, having used USA "Ram's Head" Big Muffs in the late 1970's, a Sovtek "Civil War" Big Muff in the 1990's, and Pete Cornish modified Big Muff circuits on many of Pink Floyd's greatest recordings. J Mascis of Dinosaur is another well known Big Muff user, associated with both the Deluxe Big Muff in the 1980's, a vintage Ram's Head model in the 1990's, and others. 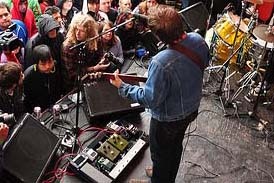 It is a trademark of his live Dinosaur Jr. sound. Jack White is another very avid user of the Big Muff, which you can hear on all the White Stripes, Raconteurs, and Dead Weather albums. 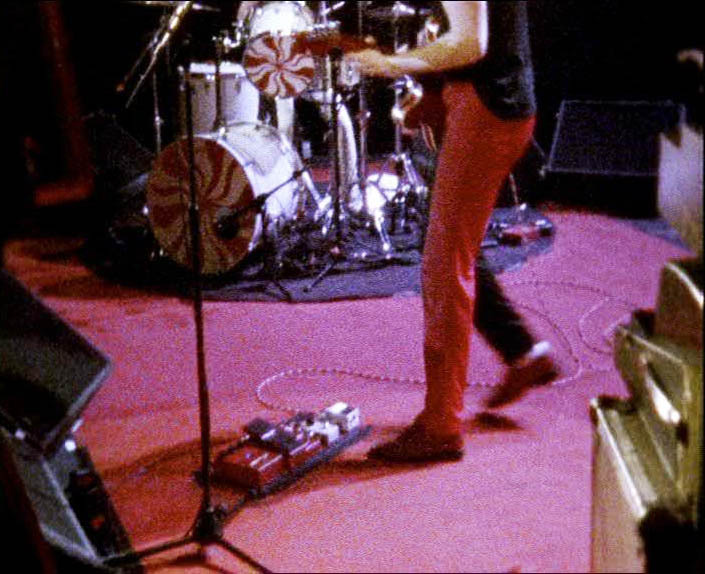 The huge bottom end of the Big Muff perfectly suited the bass-playerless White Stripes simple 'guitar and drums' format. 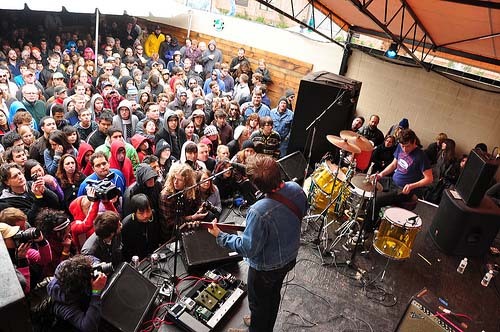 In a similar manner, Dan Auerbach of the Black Keys, another popular guitar/drums duo band, used Sovtek Big Muffs on some of the early Keys records, and in his live rig. Another user was Billy Corgan, who used a late 1970s op-amp Big Muff to such good effect on Smashing Pumpkins' Siamese Dream album. 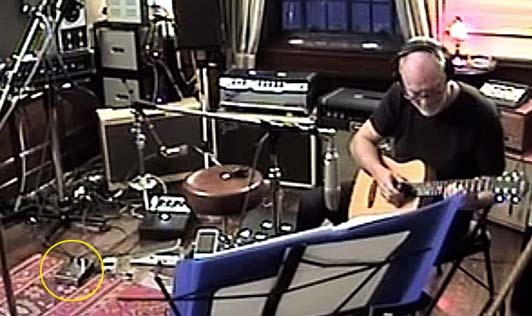 Thousands of guitarists have chased that Siamese Dream Big Muff tone. Jack White's and Dan Auerbach's Big Muff tones are perhaps the best use (in my opinion) of the unaltered, raw, crunchy Big Muff tones in all their glory, whereas David Gilmour's Pink Floyd tones best exemplify the wide range of beautiful, creamy, huge and unique sounds that can be created by combining the Muff with a clean tube amp, an overdrive, compressor, and/or modulation effects that add to and harness its tone, rather than mask it. J Mascis' live Big Muff tones are in-your-face loud, but very melodic. The Smashing Pumpkins are a great example of taking the basic late '70s vintage Big Muff tone and layering it in multiple tracks to create a massive, deep, dark, mids-scooped rhythm tone, and some incredib;e modulated Big Muff tones for solos. 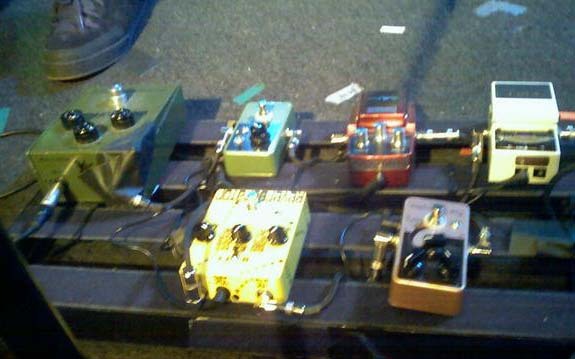 Below is a photo gallery of some famous, and some not so famous musician's pedal boards featuring their Big Muffs. If you are in a professional band and have used a Big Muff, shoot me an email (it's the bottom of the home page) and I'll add you to the users list. 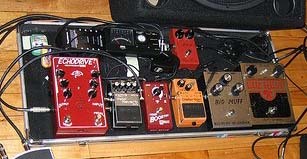 Email a pedal board photo featuring a Big Muff used in the studio or in a live show and I'll post it. 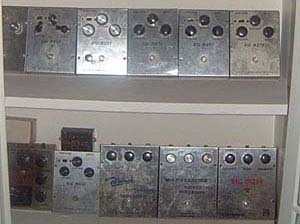 Shown above, left to right: David Gilmour's V2 "Ram's Head" Big Muff from the Animals board in 1977 (next to an Electric Mistress), the same V2 Muff from the 1986 tour board, and from the 1987 board. Gilmour's Big Muff tones come through super clean, high headroom amplifiers like the Hiwatt DR103 and Fender Showman/Twin Reverb. 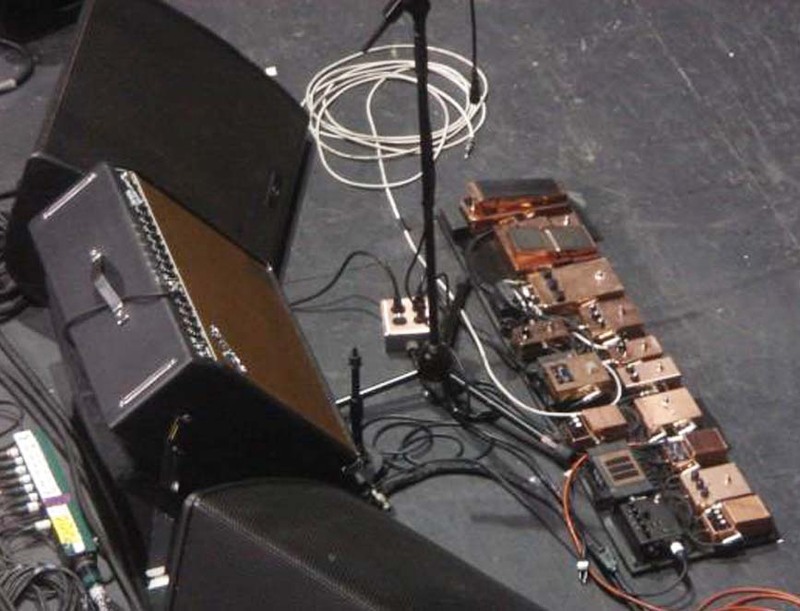 Shown above, left to right: David Gilmour's P-2 Muff, which is a modified Big Muff clone with more mids, made by Pete Cornish, and his V7 Russian "Civil War" Big Muff, all from the legendary, giant effects rack and pedal board used for the Division Bell tour in 1994. The P-2 was similar to an early Sovtek Big Muff, and was likely used as a backup for the Civil War Big Muff David used prominently on this tour. 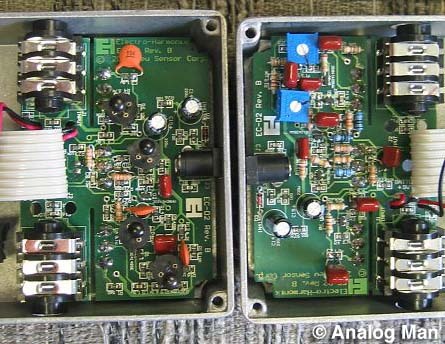 Shown above: Billy Corgan's vintage V4 op-amp Big Muff, shown with his exact settings (left), made famous on Smashing Pumpkins' Siamese Dream album. 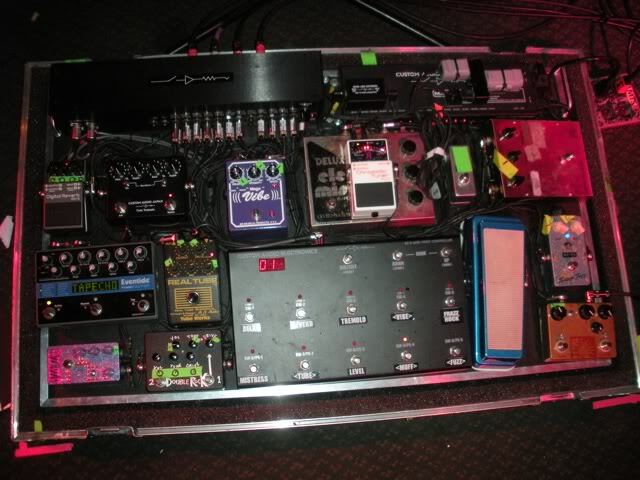 Pedal board photos are from the Machina tour. 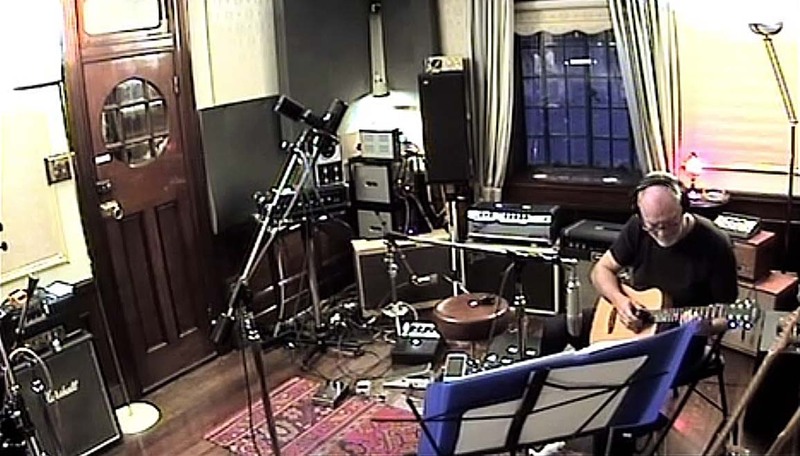 Photos on right are Billy Corgan holding his Siamese Dream era V4 Big Muff and a V5 (or possibly tone bypass V3) also used on Siamese Dream, from the Oceania recording sessions. Read the full Billy Corgan Big Muff section here. 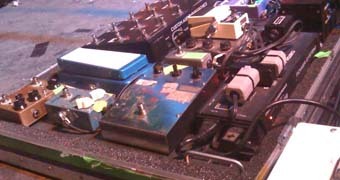 Corgan's Siamese Dream era Big Muff tones came through a Marshall JCM 800. Manys solos featured an MXR Distortion II running into the Big Muff, with effects like the MXR Pahes 100 and EXH Micro Synth used for color. 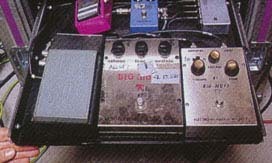 Shown above: Jack White's NYC reissue Big Muff Pi Big Muff Pi (this first version was manufactured 2000-2001) from a November 2001 gig, with a Digitech Whammy-Wah. Note the Big Muff tone knob is set all the way on the treble side and the volume is near maximum. 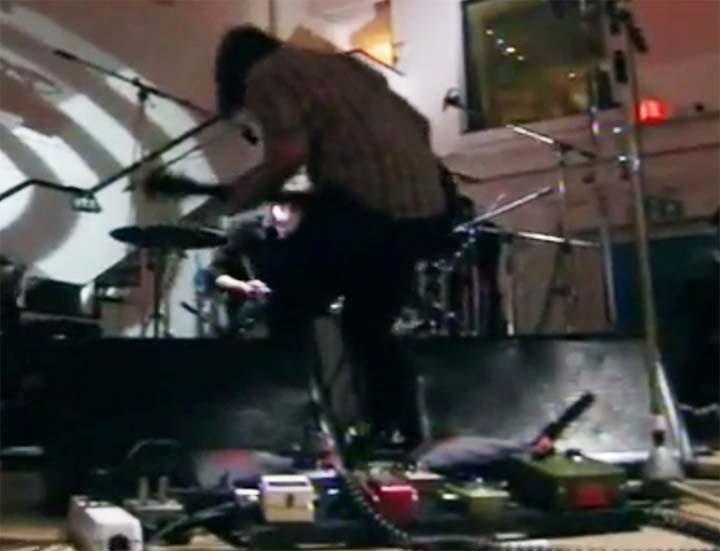 Although Jack has said he first started using the Big Muff in 1998, you only hear it ocassionally for riffs and leads starting in late 2000 on songs like Dead Leaves on the Dirty Ground and Jack the Ripper, then for a few songs on White Blood Cells in 2001, and more frequently on the 2003 recording Elephant. 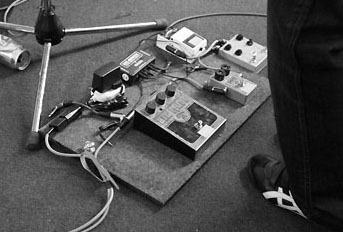 His Digitech Whammy-Wah (later switched to a Digitech Whammy) was used for an ocatve-up effect. 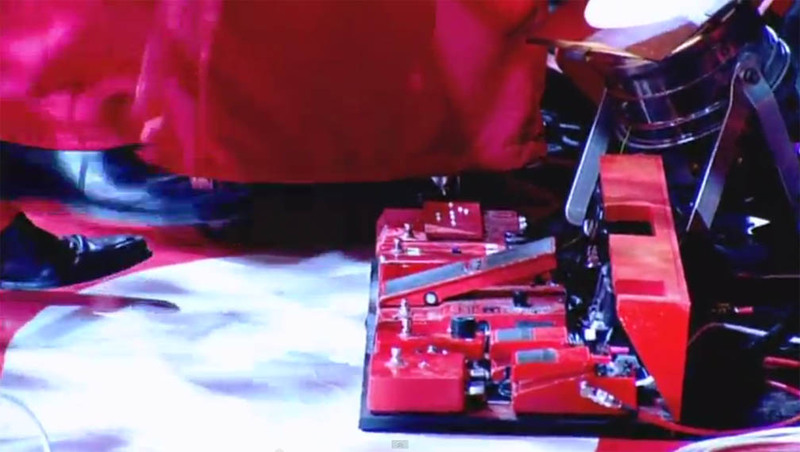 "In my small pedal chain it’s the whammy first, then the Big Muff. What I like about the Whammy pedal is that it can raise my guitar an octave and what I like about the Big Muff is that it’s just distortion. 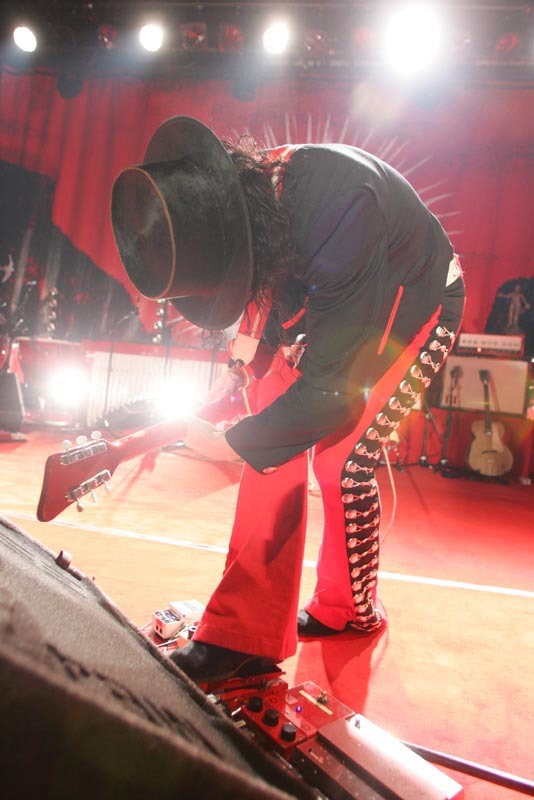 I have them in that order because it’s not high-pitched distortion, but high pitch with distortion"
The dirty clean and dirty distortion tones heard in the early White Stripes were primarily produced by a Fender Twin Reverb and the input gain on the Whammy-Wah. 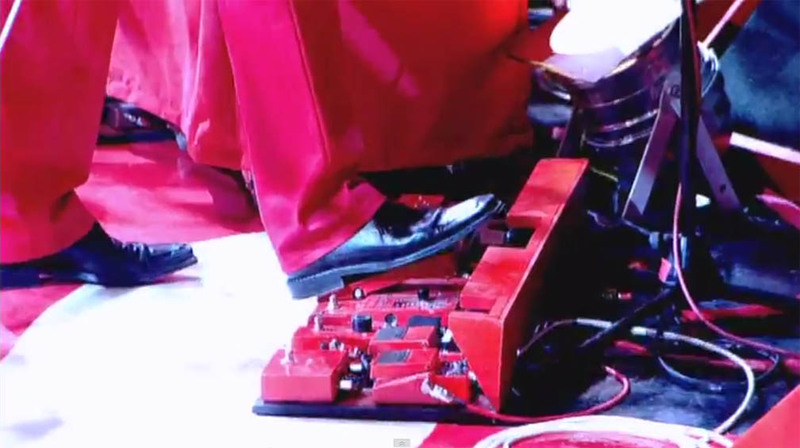 The input pot on the back of the Whammy-Wah could be used to create some slight overdrive going into the amp, and in some 2000 performances Jack can be seen bending down to turn it up for more distortion, after turning the guitar volume all the way up. 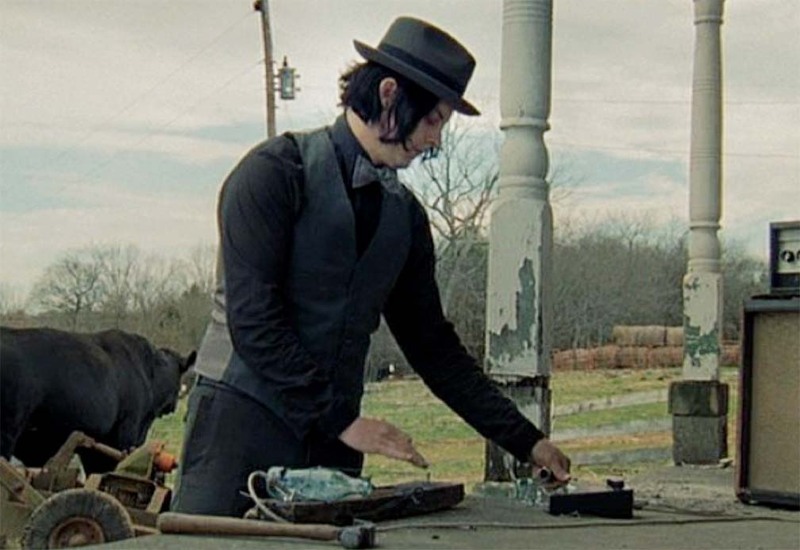 Later Jack borrowed a 100w Sears Silvertone 1485 amp (made by Danelectro) for the recording of the White Stripes first album in 1999, then bought his own. The 1485 was a two channel amp with a beautiful distortion. The crunchy breakup of the Silvertone is similar to a Marshall stack, without the need for high volume to get it. A heavy distortion can also be dialed in. 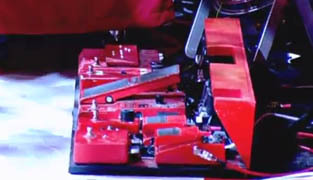 The channels can be switched via a footswitch, although it does not seem Jack ever used one. 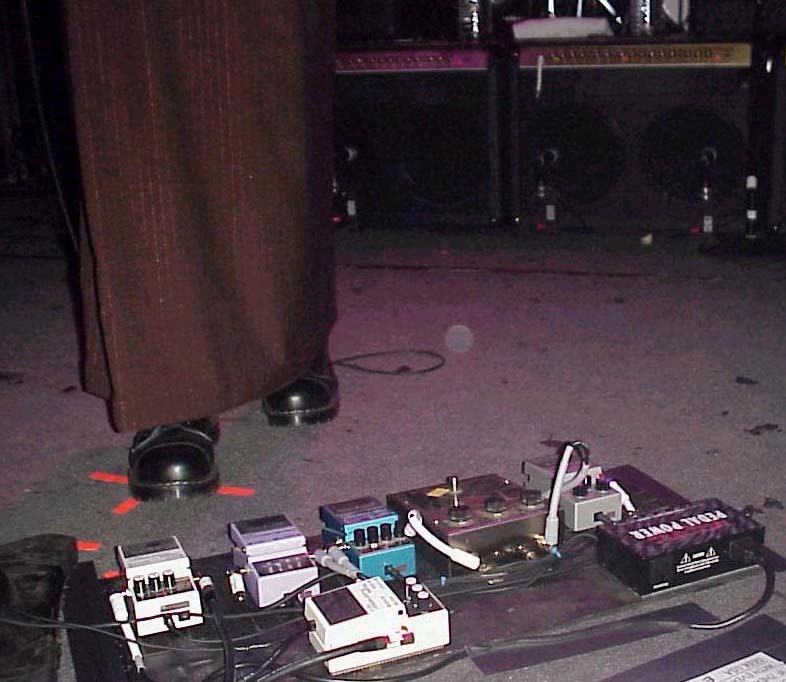 The primary setup Jack was using from 1999-2002 was a Silvertone and a Fender Twin reverb. 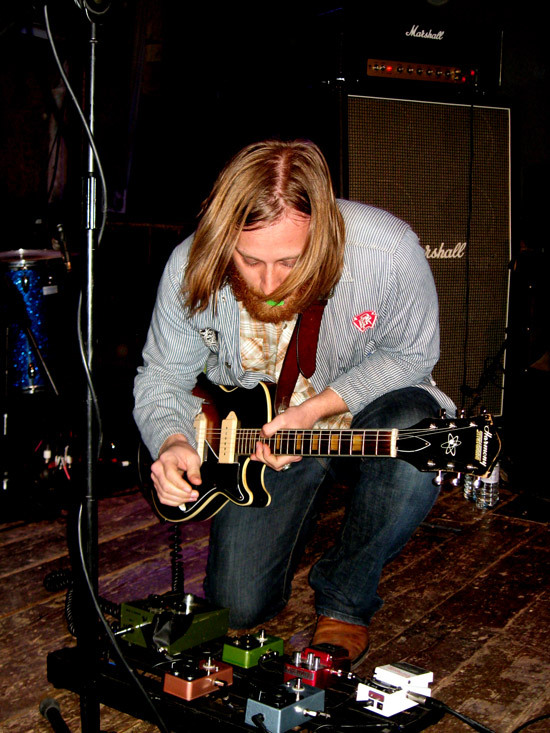 After getting the Silvertones, Jack used the Twins for the reverb, as the reverb on the Silvertone is terrible. 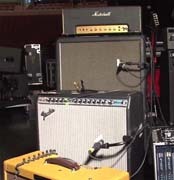 His later stage setup included a combo of two Sears Silvertone 1485 6x10 100w amps with one Fender Twin Reverb. 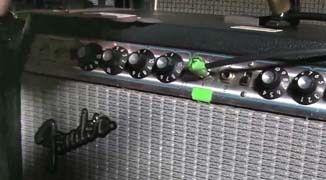 For his European gigs he kept the Silvertones safe at home and used two Fender Twin Reverb amps, along with what appears to be a compressor to dirty up the clean Twin tone slightly. 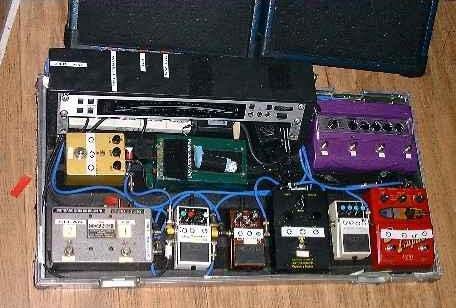 Later he added an MXR Micro amp to add some dirt to his clean tone, and that was probably left on all the time. These dirty amp tones are what many people confuse with being a Big Muff. 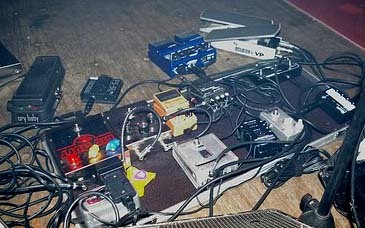 Shown above: Jack White's simple setup for a telvision appearance, circa February 2002, with a Big Muff, Digitech Whammy, and Boss TU-2 tuner. 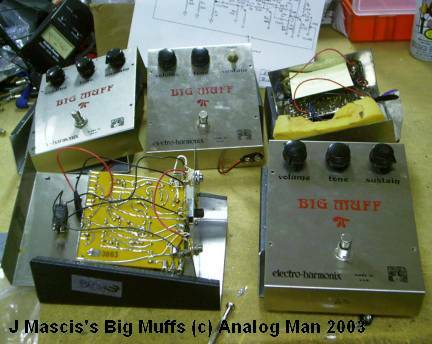 The Big Muff in the photo is most likely the same Big Muff reissue seen on stage in 2001. The Whammy is going into the Big Muff. 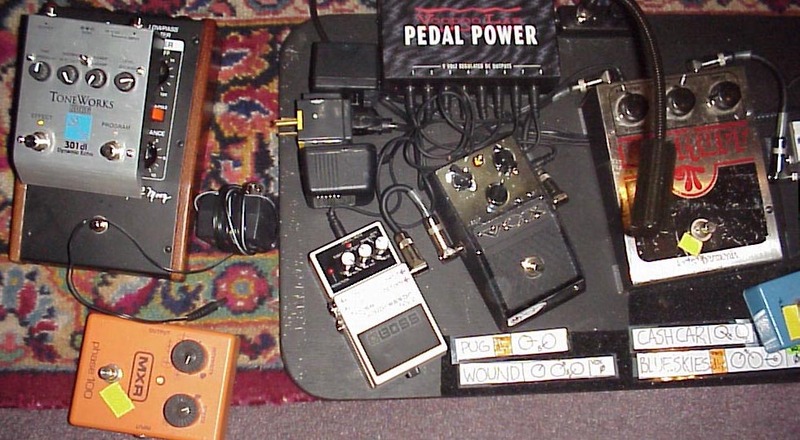 Shown above: Jack's small pedal board from January 2004 in England, with Boss TU-2 tuner, MXR Micro amp, Digitech Whammy, and Big Muff. The stock reissue Big Muff from previous boards has been replaced by a vintage 1970's Big Muff, rehoused in a small red Hammond enclosure by Analog Man. 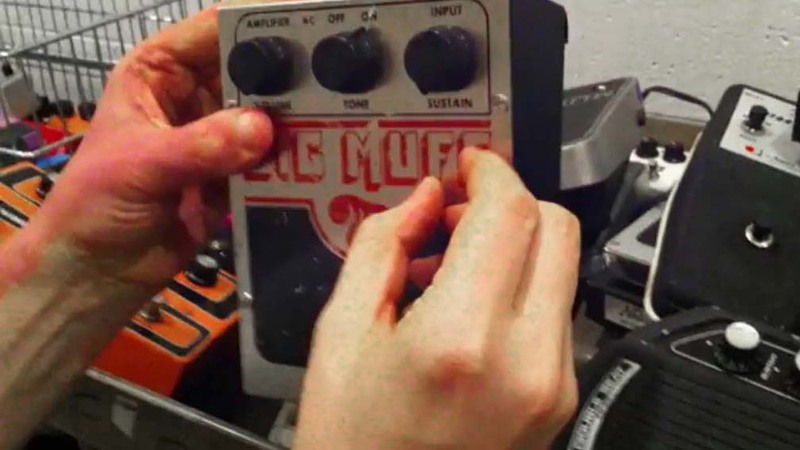 Contrary to what some sources have stated, there is no mids mod to Jack's Big Muffs. They are stock circuits. 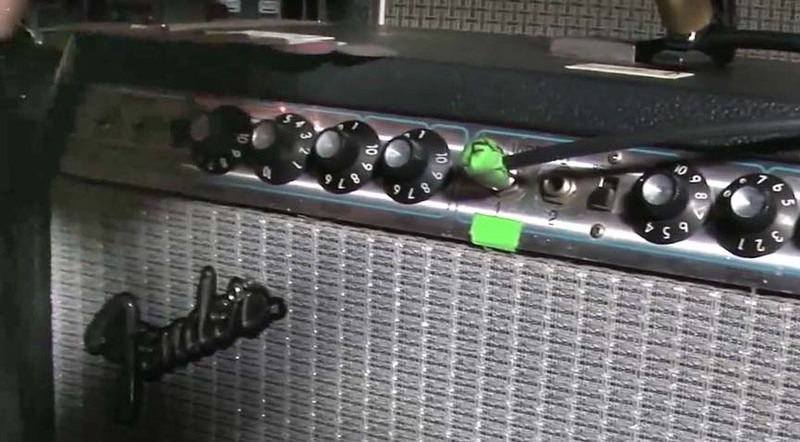 In the signal chain order, the Micro amp comes before the Whammy, and the Big Muff after the Whammy. 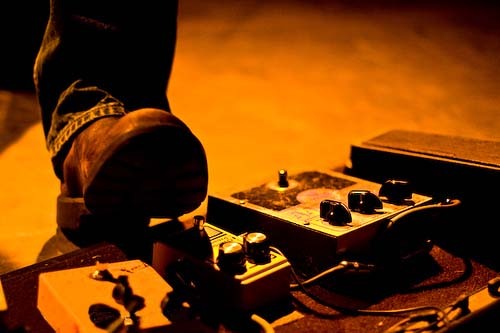 In my opinion, having a gain pedal on both sides of the Whammy gets the best results with the octave-up effect. 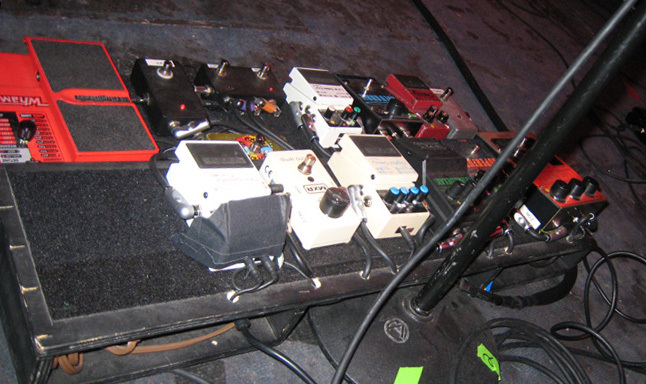 Shown above, left to right: Jack White's large pedal boards, circa 2005, with a red Big Muff (rehoused by Analog Man). Mike at Analog Man told me that this Muff is an old 1970's model, and it already had an LED added before he re-boxed it for Jack. 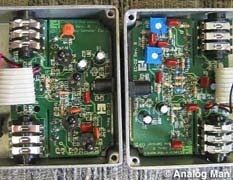 Mike stated that Jack wants his Muffs reboxed in smaller, sturdier enclosures because he crushes the stock enclosures. He also refinishes the enclosures in different colors for Jack, as he wants a different look for each of his tours for his different bands. Although it has been rumored that Jack's Big Muffs are modified (the usual myth is a flat mids mod) they are actually stock circuits. The 'mod' is the different enclosure. Based on the knob type, knob positions (all at 1:00), this is a most likely a V6 Big Muff. 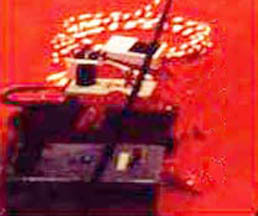 The pots in the 1970's Big Muffs were soldered directly to the circuit board, and prior to the V5/6versions, the 1:00 position shown on Jack's red Muff (above) would have made the tone completely on the treble side, but the knob type was only intoduced with the V4 and V5 versions. Jack's main distortion lead sounds from this period came from his Big Muff, used with a Digitech Whammy WH-4 with an octave-up setting, and an early Electro-Harmonix POG. Electro-Harmonix sent Jack the POG as a present when he was recording Get Behind Me Satan, first used on Blue Orchid. Jack's settings add the first and second octaves below, and one octave above the root note, for a total four of pitches of the same note simultaneously. 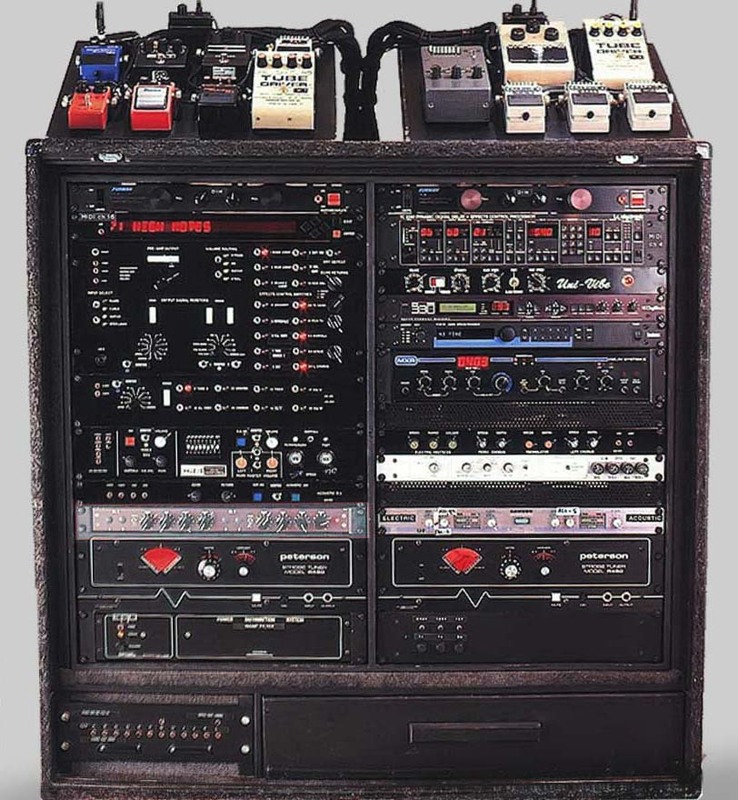 The AnalogMan box on the right (top left photo) is a tuner switch, and the large box on the left is a mute and A/B switcher for the POG, with a level pot on the back for the POG loop. 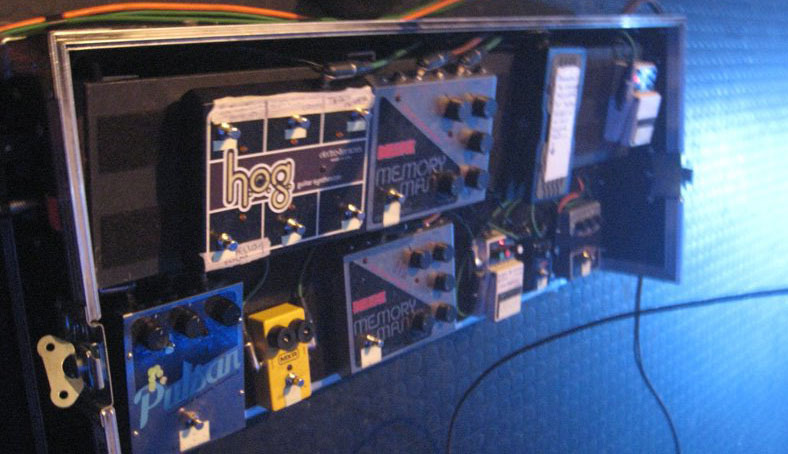 Later boards included the AnalogMan tuner switch box, Boss TU-2 Tuner, MXR Micro Amp, Digitech Whammy WH-4, Big Muff, and the Electro-Harmonix POG with with board fitted on top to keep the slider settings in place. Jacks Big Muff tones come through an old, dirty toned, Sears Silvertone 1485 amp combined with a clean Fender Twin Reverb (with the reverb on). 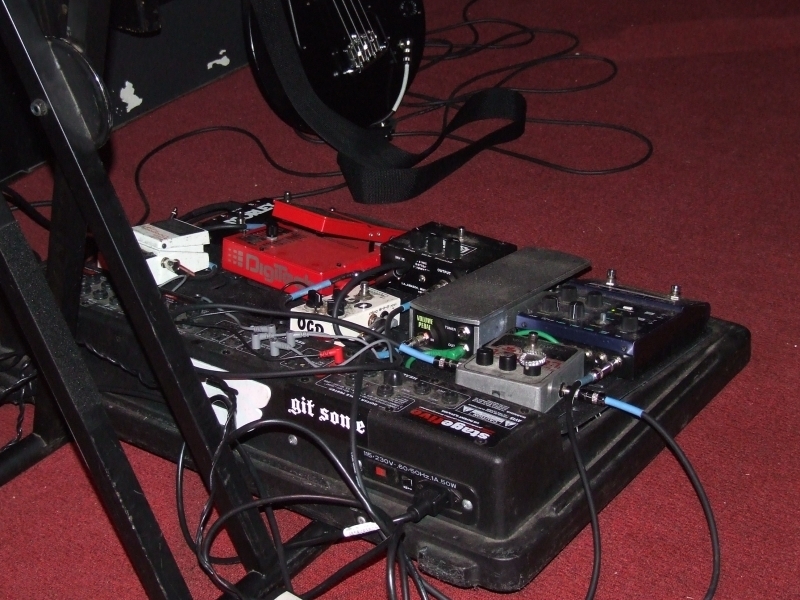 Shown above: Two small pedal boards from June 2007, showing the Boss TU-2 tuner, Digitech Whammy, and a more recent reissue Big Muff (note the LED). 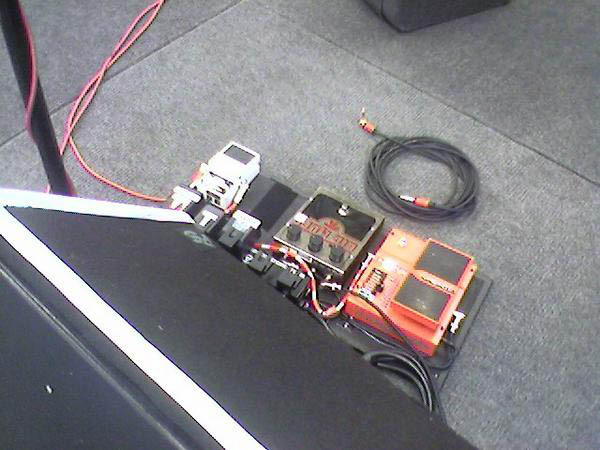 There is an extra space in both of these photos for another pedal, most likley the MXR Micro Amp. 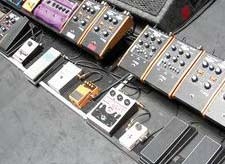 Shown above: Jack White's large 2007 European tour pedal board. AnalogMan tuner switch box, Boss TU-2 Tuner, unknown 4 knob Boss pedal used for a short time (white knobs indicate this is possibly a CE-3 compressor or LM-2 Limiter), MXR Micro Amp, Digitech Whammy WH-4, Big Muff (reboxed), and the Electro-Harmonix POG with with board fitted on top to keep the slider settings in place. 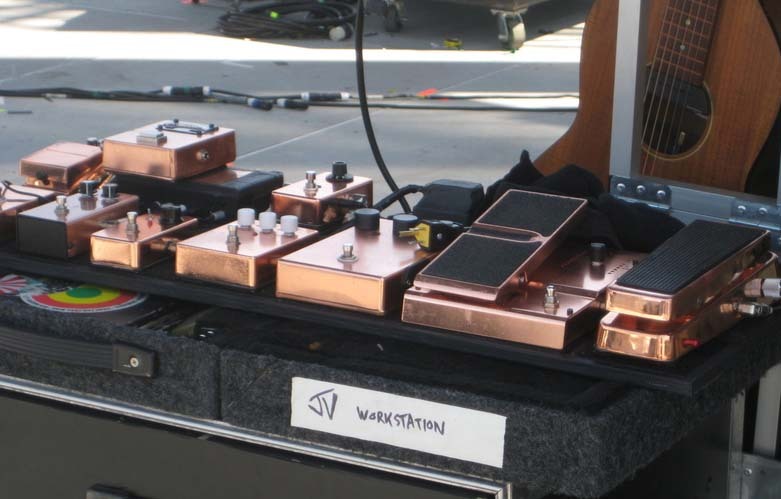 Shown above: A stripped down version of Jack White's copper plated Raconteurs pedal board with number stickers indicating the signal chain order, and showing all settings: #1 Boss TU-2 Tuner (reboxed), #2 Digitech Whammy WH4, Big Muff reboxed, MXR Micro Amp. 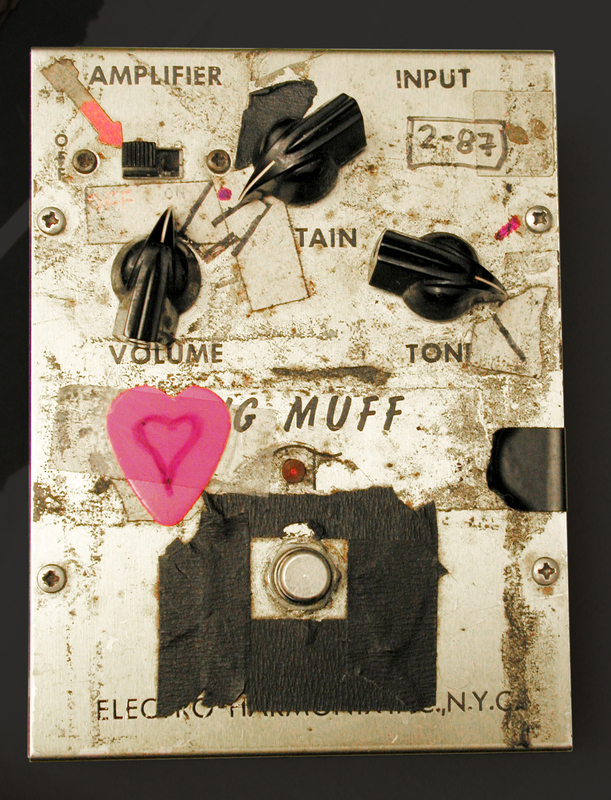 Note that the Big Muff tone knob is set for full treble. 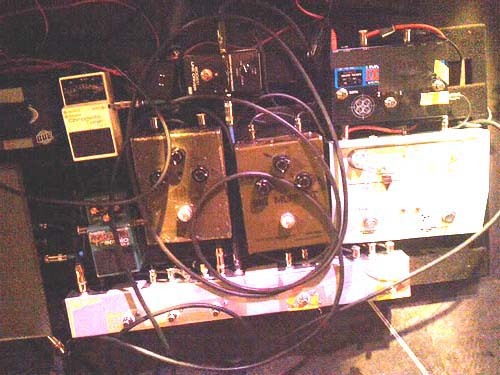 According to Jack, and following the cabling in the signal chain shown in many photos, the Whammy always comes before the Big Muff, and the Micro amp always comes after the Muff, although he has changed thsi order from time to time. 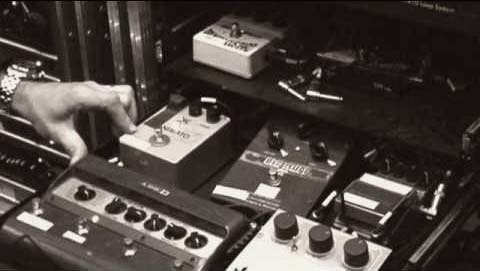 Oddly, in a 2010 interview he said the Whammy must come after the Big Muff, although he never seems to do this live: "...you need a lot of gain and distortion to make that kind of tone. It sounds really wimpy if you don’t have some power behind the note. And you have to put the Whammy after the Big Muff in the signal chain. 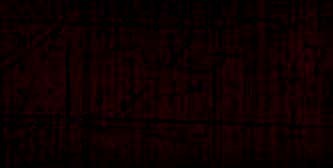 The power has to be before the octave." 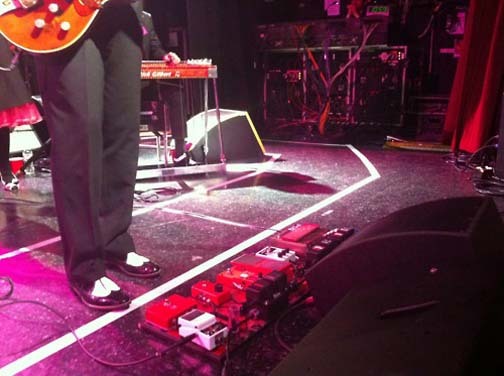 Shown above: Jack White's all white Dead Weather pedal board with Big Muff, circa 2009, also shared with guitarist Dean Fertita. 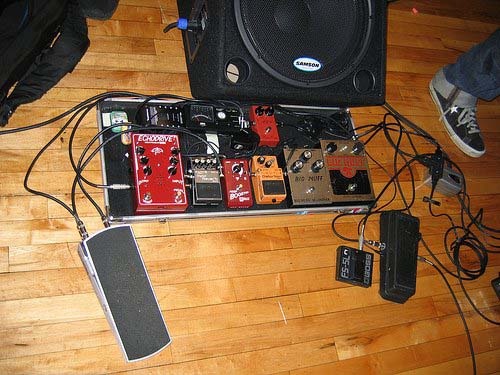 His board includes a Dunlop Rotovibe, Digitech Whammy, Voodoo lab Tremolo, Electro-Harmonix nano Bassballs, Big Muff, Micro POG, Boss TU-2 Tuner, MXR Micro Amp, and Zvex Wooly Mammoth bass fuzz. 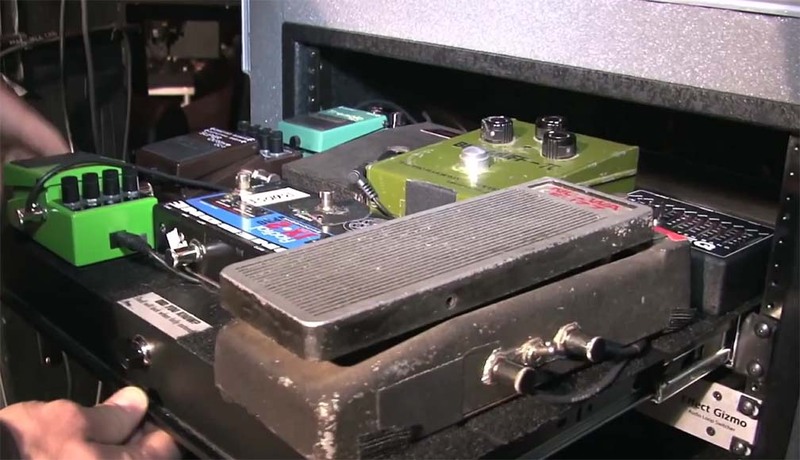 Amps for the Dead Weather tour were Fender Twin Reverbs only, no Silvertones. Jack's really overdriven, octave-up, lead sound with the stuttery breakup from this period comes from the Whammy (set for an octave up) into a Zvex Wooly Mammoth. Set the pinch knob high on the Wooly and the fuzz gates and stutters sharply, producing this signature sound for Jack. You can hear it on songs like Another Way to Die. The MXR Micro amp (gain on max) also does a similar stuttery lead sound going into the Whammy (set for an octave up), into a Big Muff, through the dirty Silvertone amp. 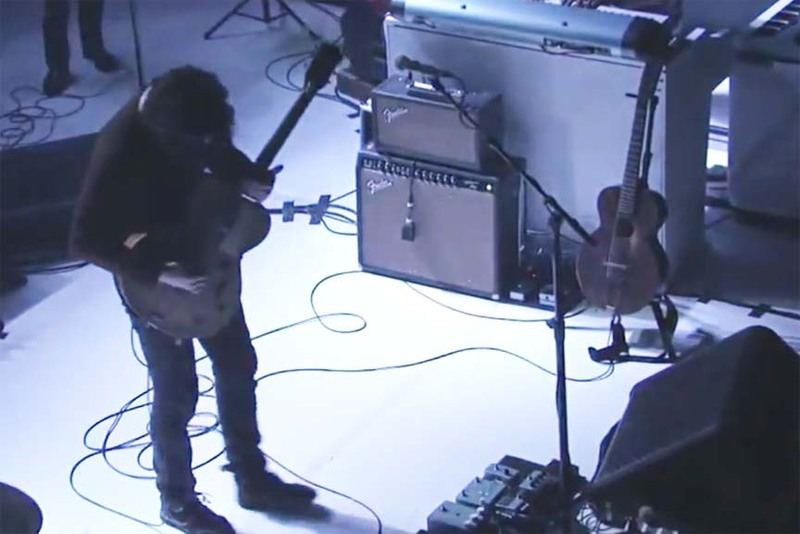 Shown above: Jack White using a Tone Wicker Big Muff when touring with Wanda Jackson in 2011. EHX president Mike Matthews sent Jack a Tone Wicker, so that is probably where this one came from. Note the pencil marks showing Jack's settings: volume and tone both set at 2:00, sustain at 4:00, tone wicker and tone switch in off position. Click to enlarge full image to see Jacks Fender Vibroverb amp settings. 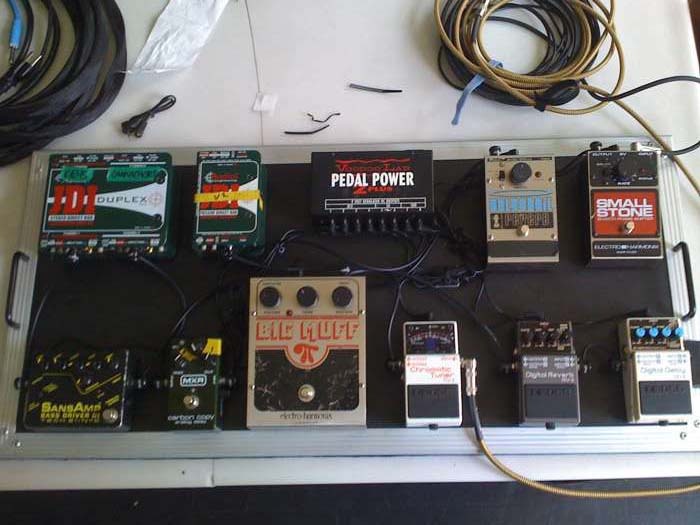 This pedal board goes back to his older, simpler, White Stripes setup and includes his AnalogMan tuner switch box, Boss TU-2 Tuner, MXR Micro Amp, Digitech Whammy, Tone Wicker Big Muff, and an Electro-Harmonix POG with board fitted on top to keep the slider settings in place. Shown above: Jack White's 2012 tour pedal board shows a return to his Raconteurs/Dead Weather range of effects, repainted in a blue-gray color. Boss TU-2 Tuner, MXR Micro Amp, Digitech Whammy WH-4, a rehoused Electro-Harmonix Big Muff Pi (based on the LED position, this is probably the original red vintage Big Muff from Jack's 2004 White Stripes pedal board, repainted), Electro-Harmonix POG 2, Electro-Harmonix nano Bassballs, Zvex Wooly Mammoth gated bass fuzz, and what appears to be a Boss NS-2 noise suppressor. 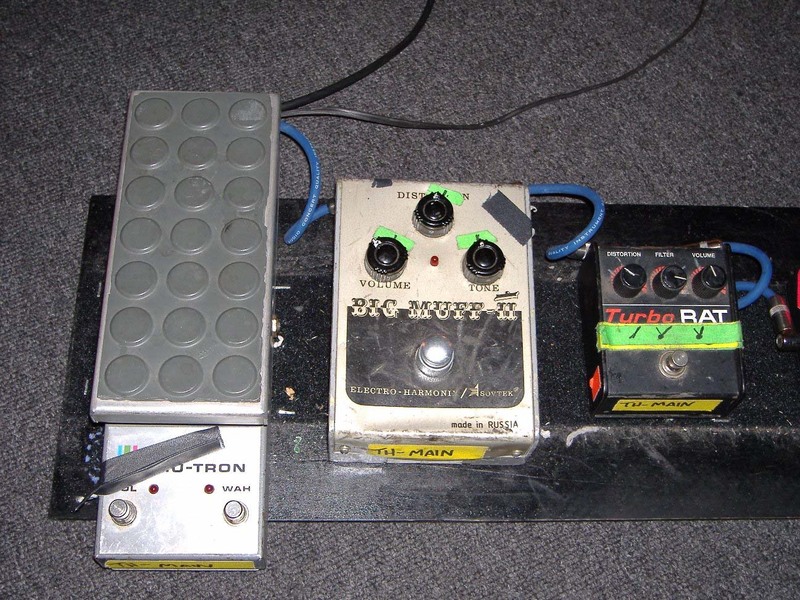 Shown above, left to right: John Frusciante's huge Red Hot Chili Peppers pedal boards with a V8 Russian Big Muff, and a 2000 USA V9 reissue Big Muff. J. MASCIS of Dinosaur Jr.
Read the full J mascis Big Muff section and interview here with lots of other pix showing J's Big Muff collection. 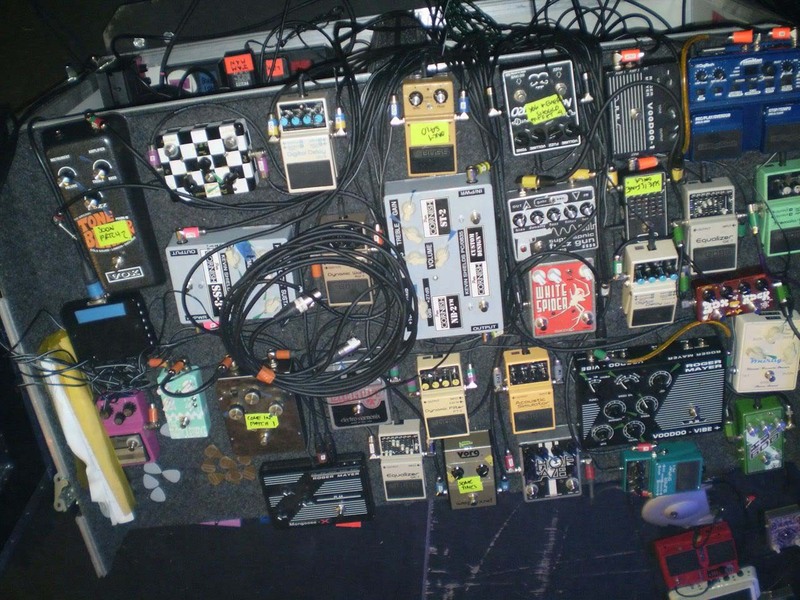 Shown above: A small portion of J Mascis' huge vintage Big Muff collection. 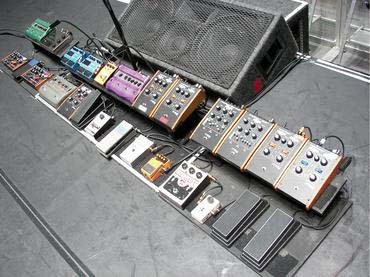 Shown above: Several J Mascis' pedal boards with both vintage V1 and V2 Big Muffs. 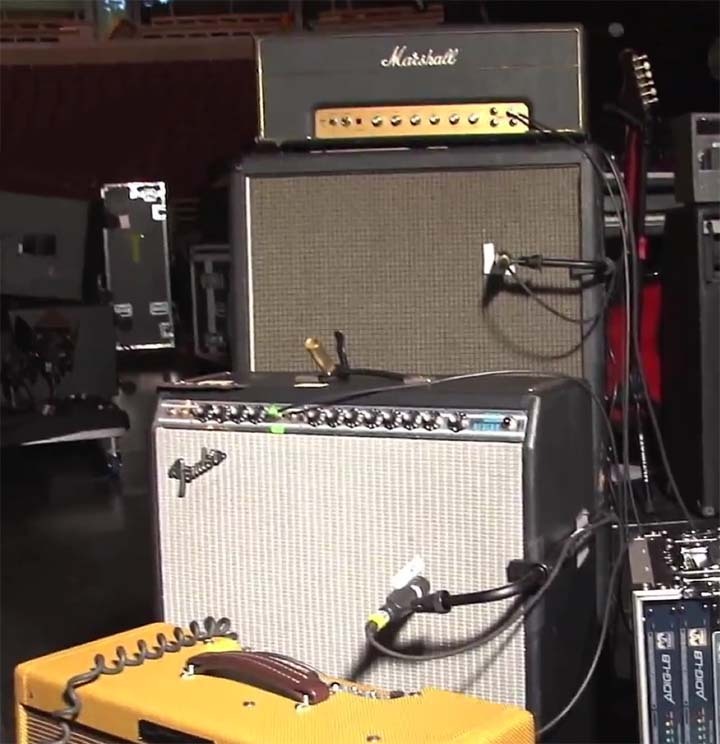 Early Dinosaur jr/J Mascis Big Muff tones, and the live Dinosaur Jr tones come through plexi Marshall 50w and 100w amp heads (Super bass and Super PA heads), and later the Marshalls combined with a Hiwatt DR103 Custom 100. 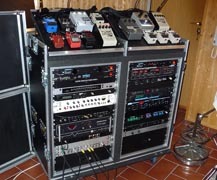 More on J's gear can be found here. 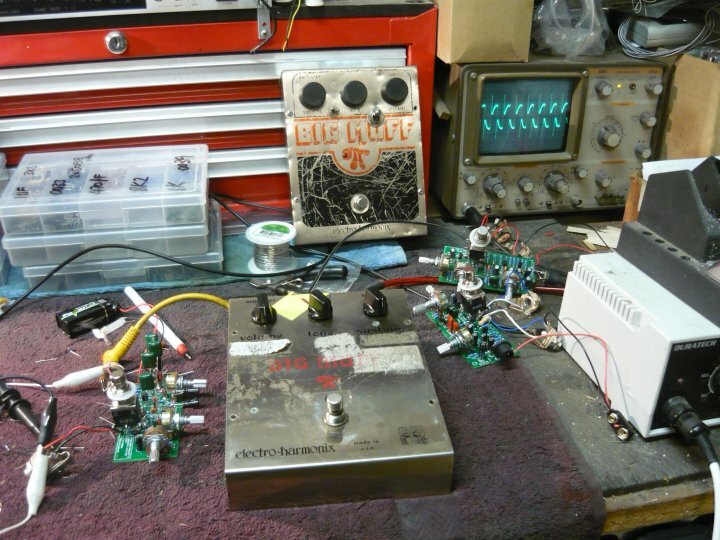 Shown above: A few of J Mascis' V2 Big Muffs being worked on by Analog Man. Thanks to Mike at Analog Man for the photos. Shown above: J Mascis' favorite Big Muff, a V2 "Ram's Head" model, which according to J sounds very different from all his other Muffs. These photos were taken when it was being repaired and replicated for J by Tym Guitars of Australia in 2010. 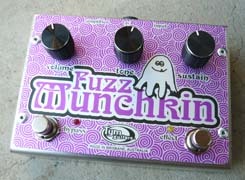 The Fuzz Munchkin pedal on the right is an exact replica made by Tim, with graphics by J Mascis. Thanks to Tim for the photos. 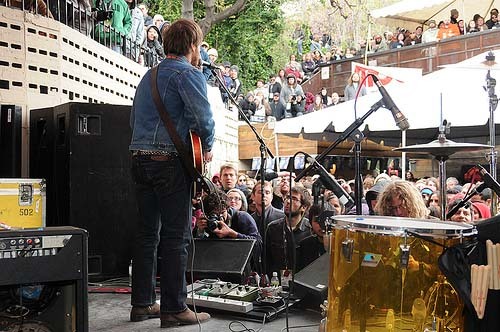 Shown above, left to right: Dan Auerbach of the Black Keys pedalboards with V7 green Sovtek Big Muff. 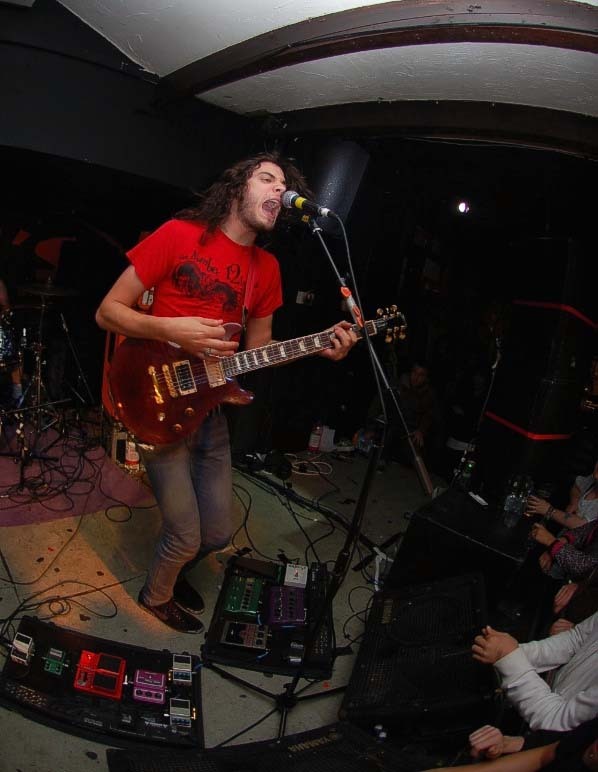 Dan fills the role of both basist and lead guitarist with the heavy bottom end found in the Russian Big Muffs. Early Black Keys Sovtek Big Muff live tones come through Fender Twin/Quad Reverbs, Fender Music Master Bass, along with a Marshall JTM45. 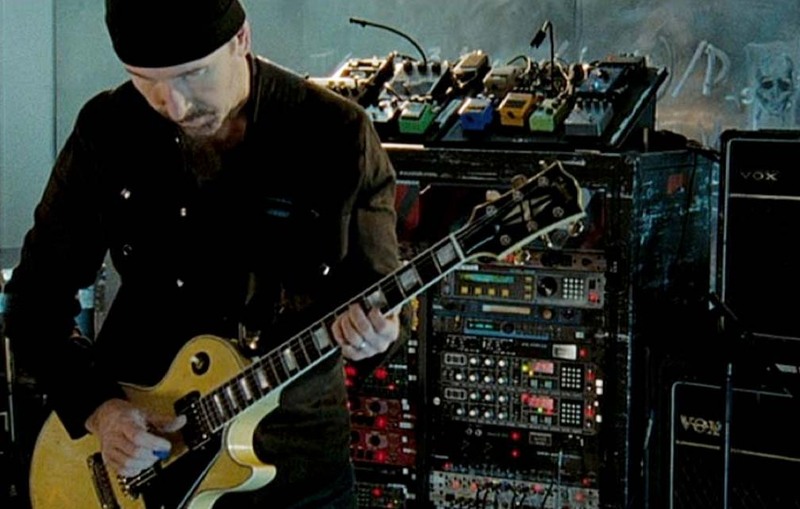 He has also used Ampeg and Hiwatt amp heads, and Metropoulos plexi Marshall clones. 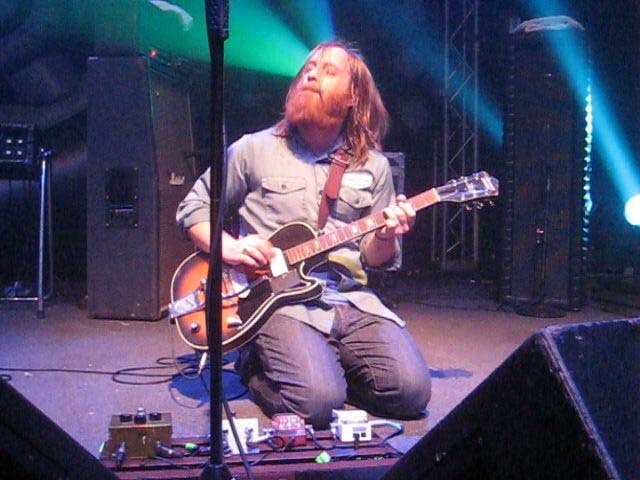 Dan uses lots of different fuzz pedals, but much of the distortion on the early Black Keys studio recordings comes from a 1970's Ibanez Standard Fuzz, and the live sound from green Sovtek Big Muffs. Dan keeps his amps slightly dirty, but still clean enough not to make the Big Muffs sound farty. 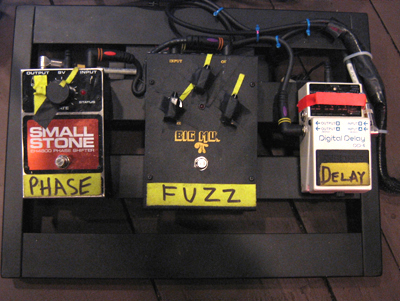 Shown above, left to right: Dan's 2010 board includes one green tall font Russian Big Muff and one bubble font Green Russian. Each has a slightly different tone, and Dan's settings are very different for each. 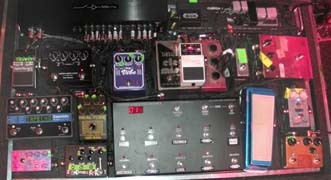 Shown above, left to right: Dan's live rig for 2012 (thanks to Premier Guitar) now finds his pedals in a rack tray. 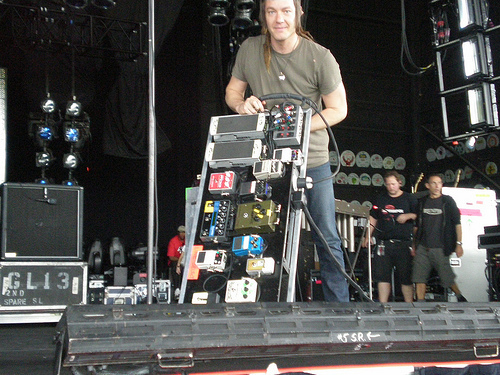 Dan controls them with a new floor switcher system, put together by his guitar tech Dan Johnson. 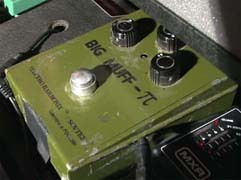 The rig once again includes his "tall font" green Russian Big Muff for the older Black Key's songs. 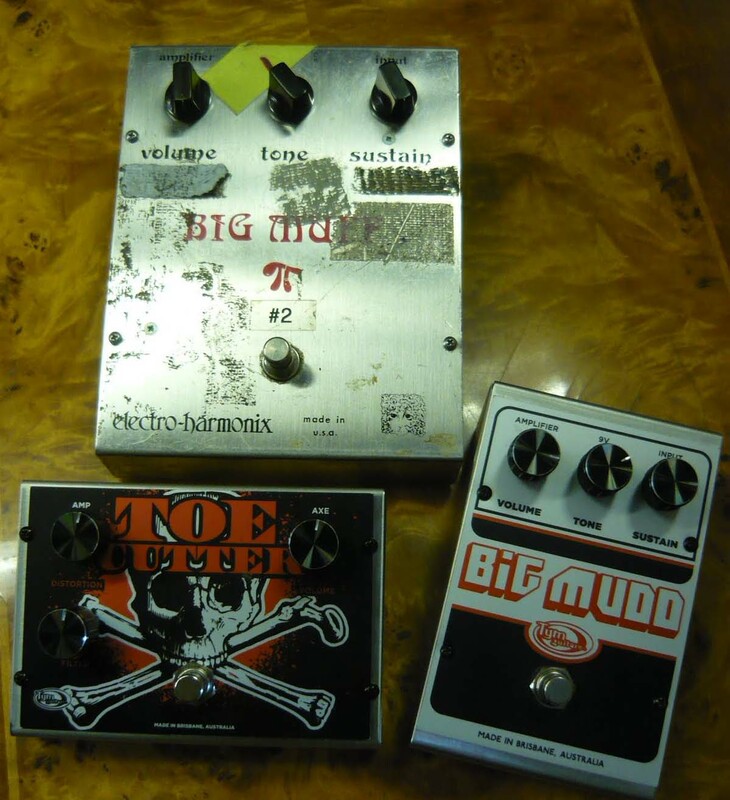 Tall Fonts typically used the exact same circuit as the earlier Sovtek version in the gray and blue boxes, the "civil war" Big Muff. 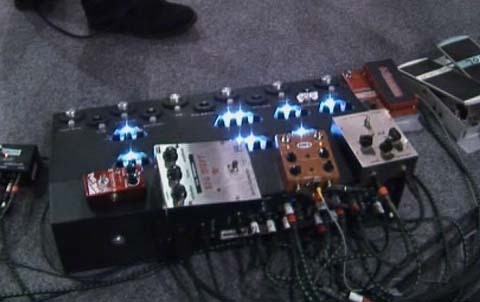 Dan's tray effects include a Radial Tonebone JX-2 Switchbone (for boost), a Boss TR-2 Tremolo, Boss OC-3 Super Octave, Boss PH-3 Super Shifter (used with the TR-2), Rosac Nu Wah Fuzz (A Mosrite Fuzzrite style fuzz with the wah disabled), the Sovtek Big Muff, a Shin-Ei FY-2 Companion Fuzz, and an MXR EQ (for the FY-2). 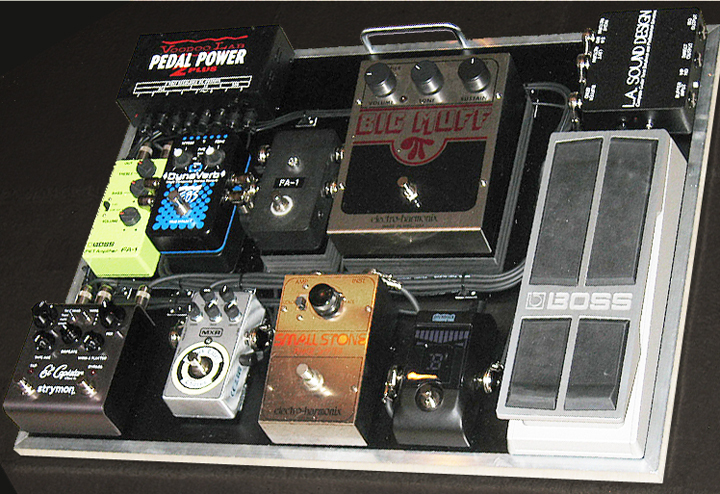 He also uses a Fulltone Tube Tape echo (going into the Marshall amp head), and a Boss PS-5 Super Shifter. Dan uses three amps simultaneously, always on, all slightly dirty. A Victoria Double Deluxe (Fender Tweed Deluxe clone X 2) with Eminence Legend speakers, a Fender Quad Reverb with two 25w Celestion Greenbacks and two vintage 30w Celestions, and a Marshall JTM-45 Head with Jensen speakers. 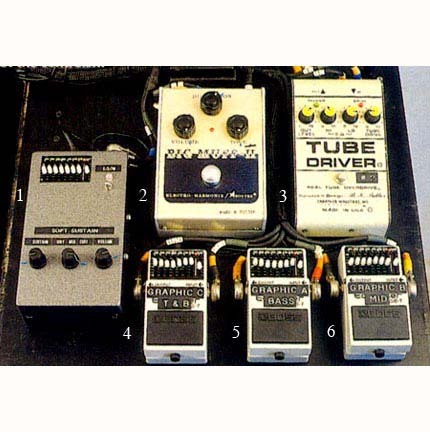 Shown above: V9 Big Muff used by lead guitarist Jamie Cook of the Arctic Monkeys on his early pedal board. In the photo on the right there appears to be a Little Big Muff . 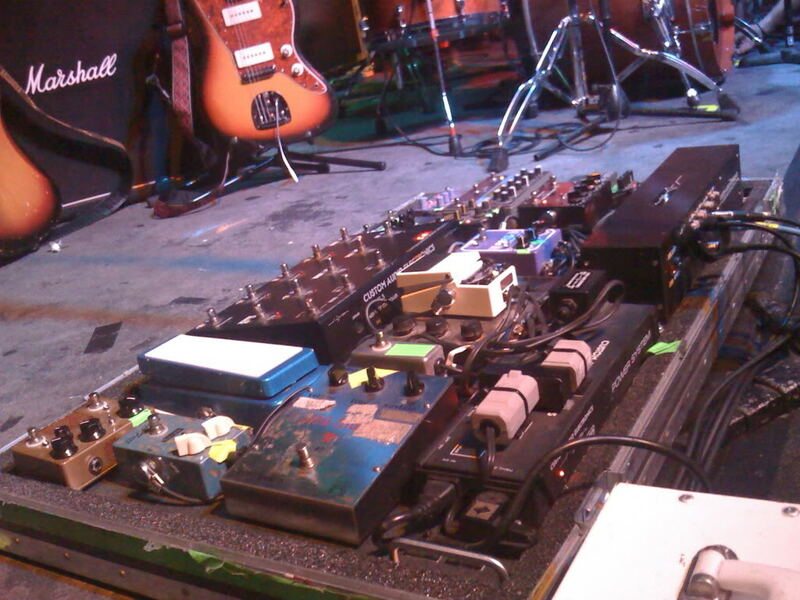 Shown above: Rich Robinson's V9 Big Muff from his 2013 pedal board. 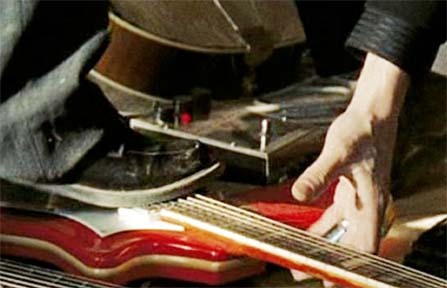 He uses it with a Gretsch hollow body guitar. Shown above, left to right: A vintage tone bypass V5 or V6 Big Muff on the rack boards of The Edge from U2. 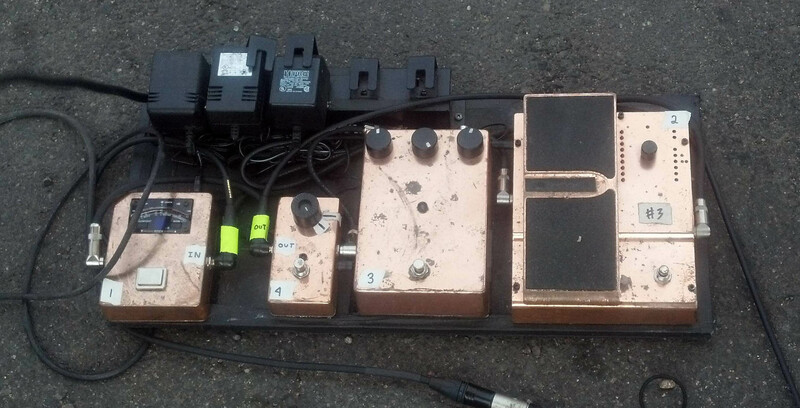 Shown above, left to right: Jeff Jourad's (The Motels, Dance Hall Pimps, The Roosters) well used and modded Triangle Big Muff, purchased in 1978 for $15, Pete Townshend (The Who) in 1977 using a V3 Muff taped on top of his amp, with his Gretsch Chet Atkins 6120 guitar for his solo album recordings in 1977, and Mike Mill's (R.E.M.) 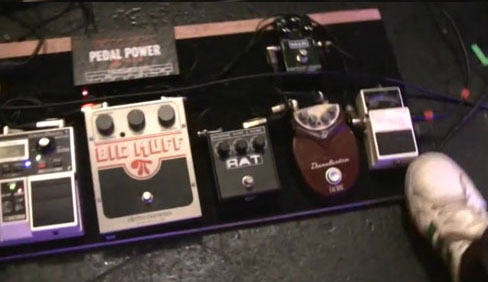 V8 Russian Big Muff from his bass pedalboard. 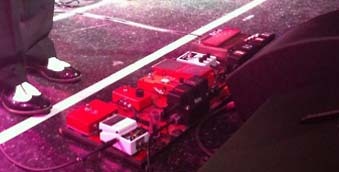 Shown above, left to right: Flea's (Red Hot Chili Peppers) pedal board with V9 Muff, Mudhoney's Big Muff, and two shots of Beck's Big Muff . 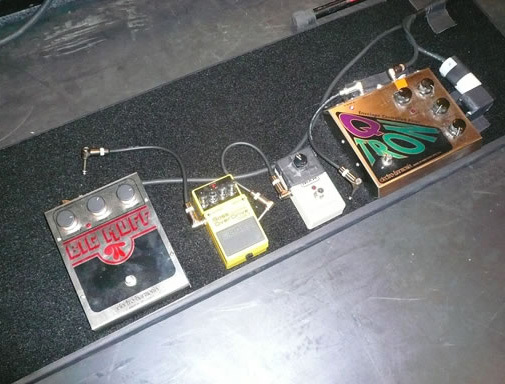 Shown above, left to right: V7 green Russian Big Muff used by Robin Finck (Nine Inch Nails), Brock Butler (Perpetual Groove) using a V9 Big Muff, and Tommy Henricksen of Alice Coopers band using a V9 Big Muff. Here is a list of numerous Big Muff Pi users. 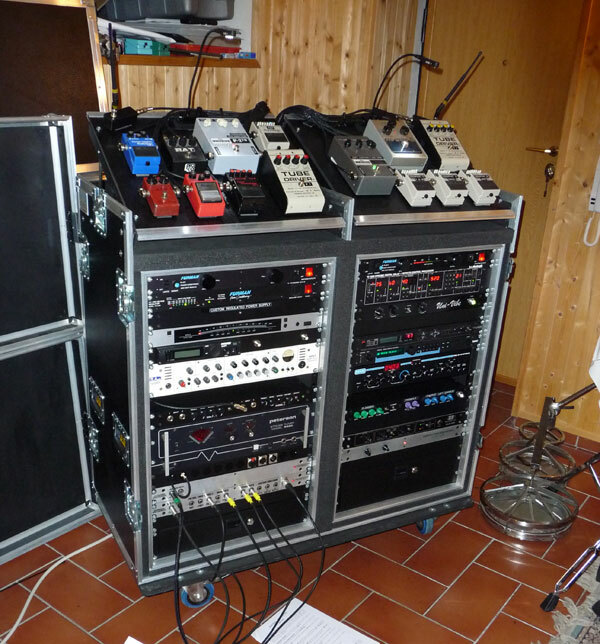 Often people simply throw out a guess about gear a band has used, and that turns into internet "fact" after it becomes repeated over and over. I have attempted to verify that each of these guitarists or bands have actually used a BMP with documentation from interviews, band articles, or photographic evidence, although I am still looking for verification on a few. 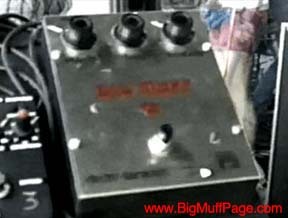 Carlos Santana - Purchased a Triangle Big Muff in February of 1971, but it is unknown if he ever recorded with one. John Lennon - Purchased a Triangle Big Muff in August of 1971 in New York, but it is unknown if he ever recorded with one. 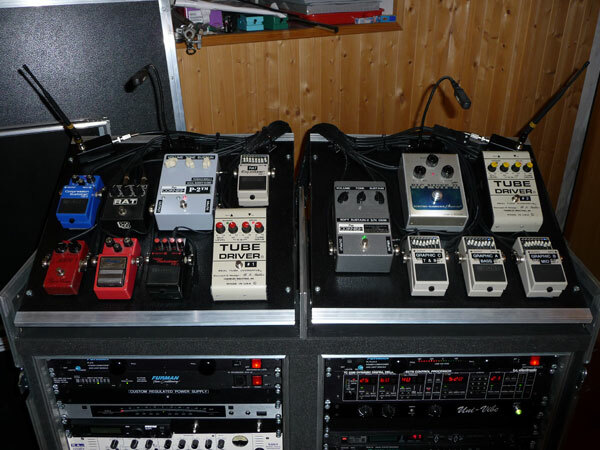 John Fogerty - John is a Russian Big Muff collector and has used them from time to time. Tony Peluso - used a triangle Big Muff for The Carpenters song, Goodbye to Love in 1972. 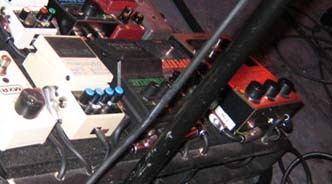 Ernie Isley of the Isley Brothers often used a Ram's Head Big Muff in his live rig. Bootsy Collins - Used Big Muffs in his 1970s bass rigs when he played with James Brown and George Clinton's Parliment/Funkadelic. 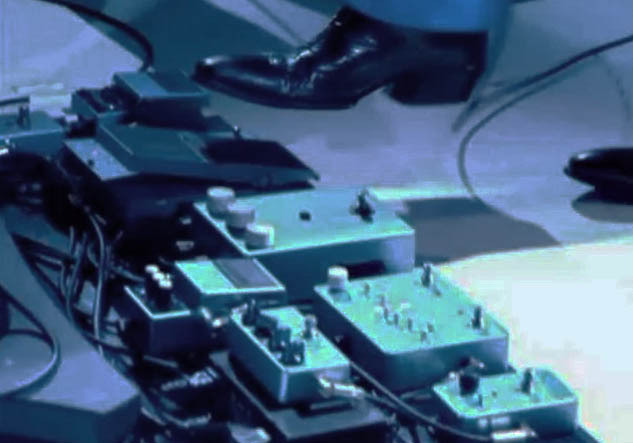 Robert Fripp of King Crimson - Fripp used a lot of fuzz pedals in his early years, but he has said he used a Guild Foxey Lady, a wah-wah, and volume pedal in the from the 1972-74 era. He played them with humbucker equipped Les Pauls and Hiwatt amplifiers. 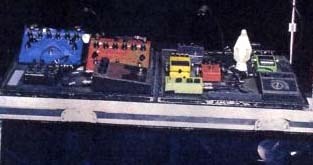 Fripp has said he used a late 60's Foxey Lady, which would indicate this is the two knob Guild Foxey, but effect pedal board maker Pete Cornish stated in an interview published in Music UK Issue #6 in 1982 (by Tony Bacon) that the first pedal board he ever made was for Robert Fripp in September 1973, and it included the 'Guild Foxey Lady, Guild's version of the Big Muff Fuzz'. 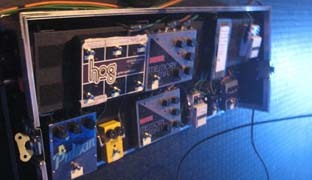 In a 2010 post from Fripp's own blog he suggests a Big Muff or a Foxey Lady pedal to get those tones, reconfirming he did use the Big Muff version of the Foxey Lady. 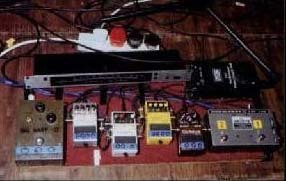 He has also used a Russian Big Muff at times in his 1990's live rig. 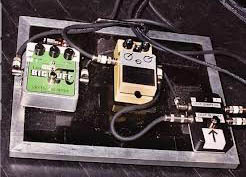 David Gilmour of Pink Floyd - Primary distortion pedal used throughout his career beginning in 1977 was a V2 Big Muff. Alex Lifeson of Rush - Alex said he used a Big Muff for the Anarchist solo from Clockwork Angels. He has also said he likes the Rissian Big Muff. 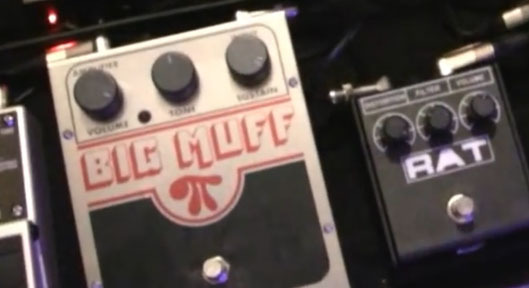 It has also been rumored that Alex used a Big Muff on some early Rush material, like Working Man, but I hve never found any verification of that. 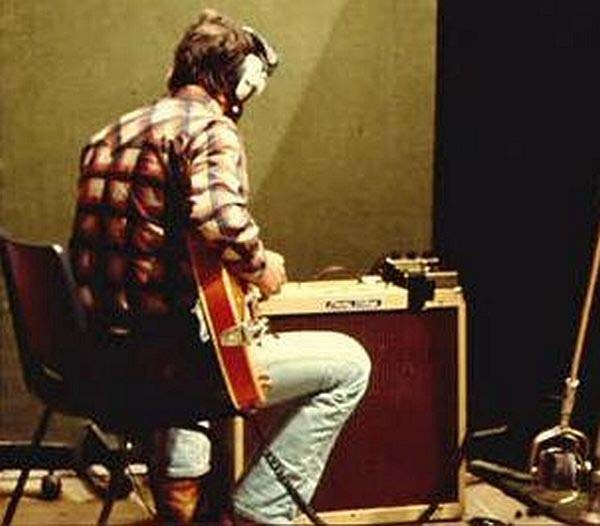 Pete Townshend of The Who - Spotted using a V3 Big Muff in the studio in the late 1970's. 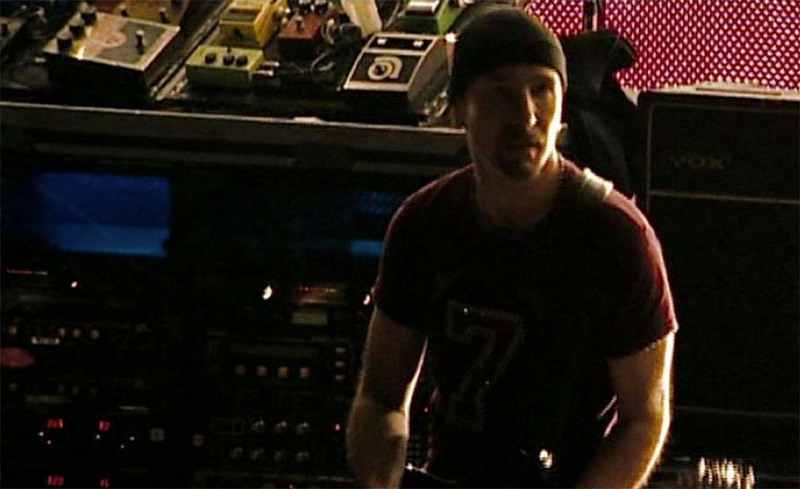 The Edge of U2 - A USA reissue Big Muff is often used in his giant effects rack. Ronnie Montrose of Montrose - A Les Paul, Tweed Fender Bandmaster, and a V1 Big Muff was used on their first Montrose album in 1973. 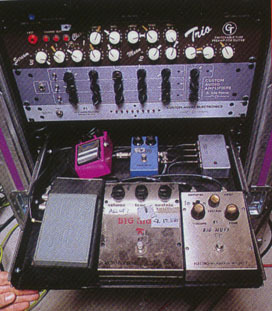 J Mascis of Dinosaur jr - Deluxe Big Muff used on first three Dinosaur jr albums in 1980's. 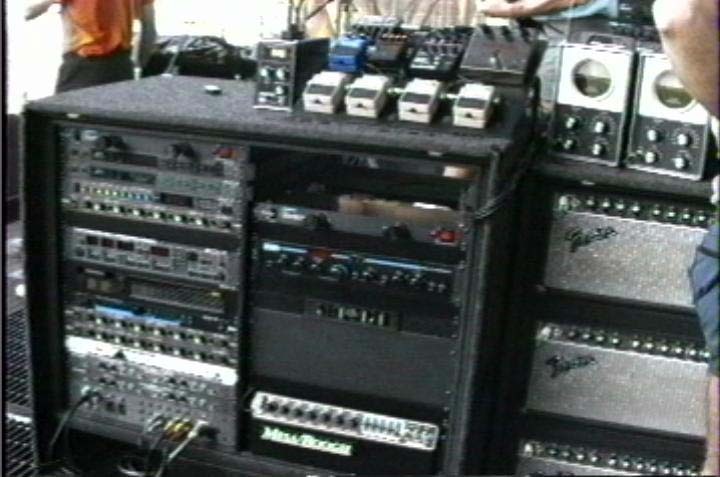 A Ram's Head Big Muff was used from 1987 on, mostly in his live rig. Billy Corgan and James Iha of Smashing Pumpkins - V4 op-amp Big Muff and V3 transistor Big Muffs used on Siamese Dream and occasional use on later albums. 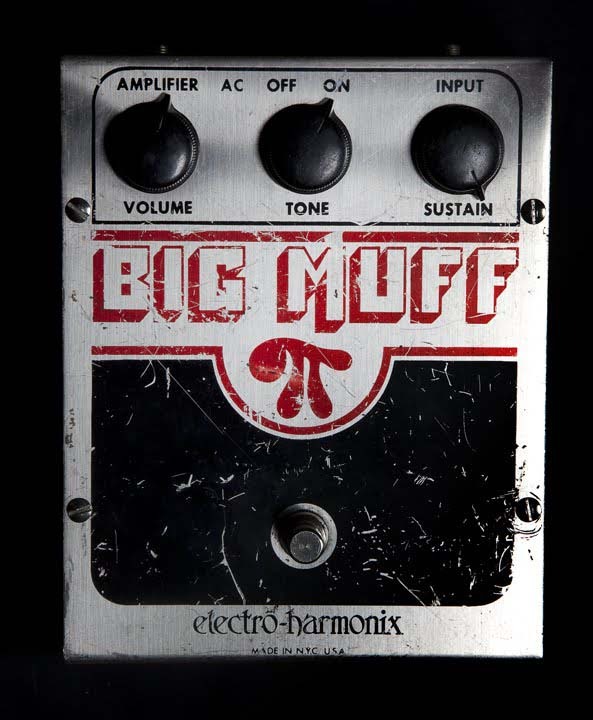 Steve Turner, guitarist for Mudhoney - Steve was a Big Muff user, and Mudhoney used it on their 1988 EP named, Superfuzz Bigmuff. 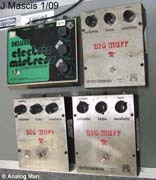 The Big Muff was a popular pedal during the 1990s grunge/alternative rock scene. 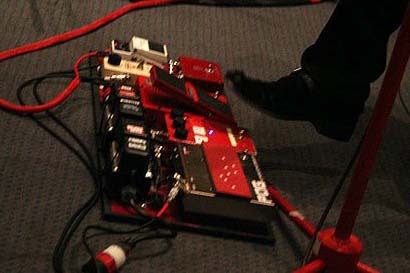 Mike Mills of R.E.M.- Mike used a Sovtek "Civil War" Big Muff in 2004, and has laso been seen with the stick black Russian Big Muff. Pete Buck of R.E.M. - Pete used a Red Army Big Muff nicknamed "sputnik" on Monster. Big Muff also possibly used on Accelerate. 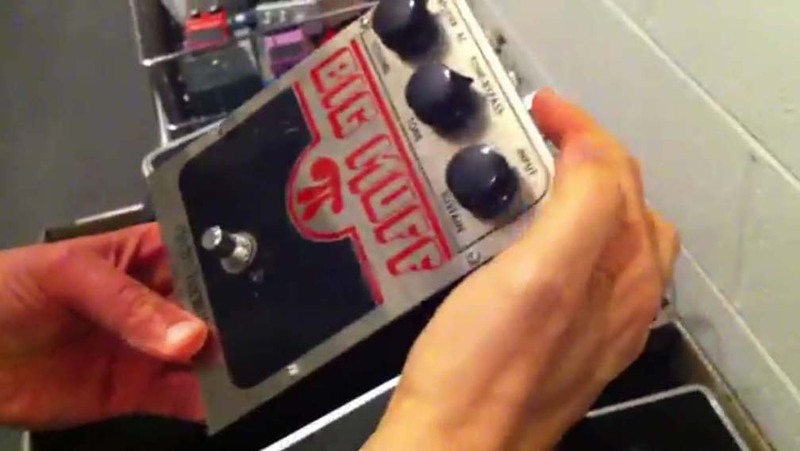 Jack White of The White Stripes, Raconteurs, and Dead Weather - Used a vintage 1970's Big Muff on early White Stripes recordings and concerts, switching to a V9 USA reissue Big Muff for his later work. Alsu used a Tone Wicker Big Muff. 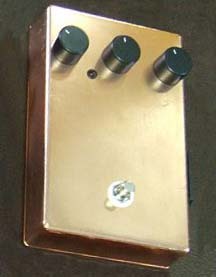 Jeff Jourad of The Motels - V1 Big Muff.